Stricter rules on online platforms restrain potential trade, especially for smaller businesses. This is because online platforms facilitate export and import by lowering transaction and information costs. Ultimately, restrictions on online platforms limit the capacity of the ICT sector more generally to contribute to the overall economy. A recent study by McDaniel and Parks (2019) shows that, among those businesses that export, the share of firms using Facebook can be high for some countries. For instance, in Czech Republic, Portugal, Turkey, and South Korea more than 15 percent of businesses that export are also on Facebook. This share is even higher for small and medium sized firms (SMEs). Therefore, it seems that the use of online platforms such as Facebook creates a stronger propensity to export compared to other firms. Once a firm finds itself on a digital platform such as Facebook, its presence can help to create visibility and to capitalize on the platform’s online network, eventually reducing information and search costs for companies and consumers. According to the study, some developing countries profit the most from being present on Facebook. In Bangladesh and Pakistan, for instance, 20 and 18 percent of businesses that export are also present on this social app. However, to make use of online platforms is not always an easy task. Certain policies inhibit companies from accessing online platforms, especially foreign ones. These policies often create unnecessary costs for businesses, particularly for smaller firms as they make it difficult to intensify exporting abroad. Moreover, and perhaps even more importantly, the presence of online platforms themselves is not a given in some countries reducing the ability of small firms to promote their businesses online in the first place. This phenomenon is a problem if we consider an increasingly strict regulatory environment for online platforms. In a recent study by me and my co-author Martina Ferracane, we show that this is actually true for quite a number of countries. The study maps the regulatory environment for online platforms in terms of trade restrictiveness for 64 countries. More precisely, we measure the online platform trade restrictiveness using the information available in the Digital Trade Estimates database, from which we have already developed the Digital Trade Restrictiveness Index (DTRI). By selecting only those policy measures that affect online platforms and by finetuning the methodology, we have created the Digital Platform Restrictiveness Index (DPRI). In the analysis, we focus on three different categories of platforms, namely search engines, e-commerce and social media platforms. For the three categories we create separate indexes, each covering only for the restrictive cost measures that affect the category specifically. Taking the DPRI index for social media platforms and relating them to the findings presented by the McDaniel and Parks study on the share of small business active on Facebook, an interesting pattern appears. That pattern is shown in the left-hand panel of the figure below. On the horizontal axis of this figure we plot the DPRI for social media platforms, whereas on the vertical axis we plot the share of small firms being present on Facebook from McDaniel and Parks. Clearly, a negative relationship appears; that is, countries with stricter trade regulations on platforms have a much lower share of small businesses being on Facebook. When restricting our group of countries to non-OECD countries only, which mainly captures emerging economies such as Indonesia, India and Vietnam, this relationship becomes even starker with less variation across countries. This can be seen in the right-hand panel of the figure above. Countries such as Russia, Vietnam and India have high regulatory restrictions compared to Brazil, South Africa or the Czech Republic. 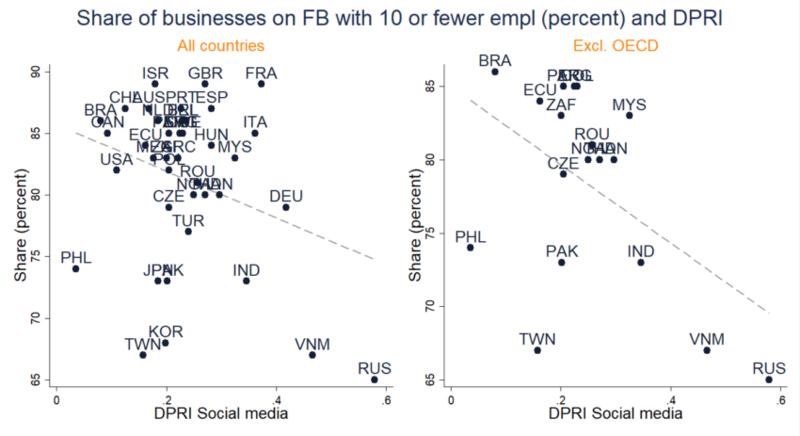 The latter countries have a higher share of small firms present on Facebook. As a result, our study makes clear that the regulatory regime for online platforms matters and in fact appears to play an important role for firms to exploit their businesses effectively online and export. But there is more. Our paper also shows that stricter regulations on online platforms is more generally negatively associated with the ability of ICT as such to contribute to the economy, namely productivity, Higher restrictions in online platforms reduces the likelihood of all kinds of firms to make use of ICT. Of course, the result is consistent with the outcome described in McDaniel and Parks: if small firms are unable to go online because of burdensome regulations applied to digital platforms, the result will be that small firms will fail to experience an extra boost of productivity and will forego any increase of exports. Therefore, a strict regulatory environment on the use of ICT services ultimately restrict firms in exporting their goods and services.